00:13:00 Makes 4 servings, two wedges (21 g) each. Makes 4 servings, two wedges (21 g) each. 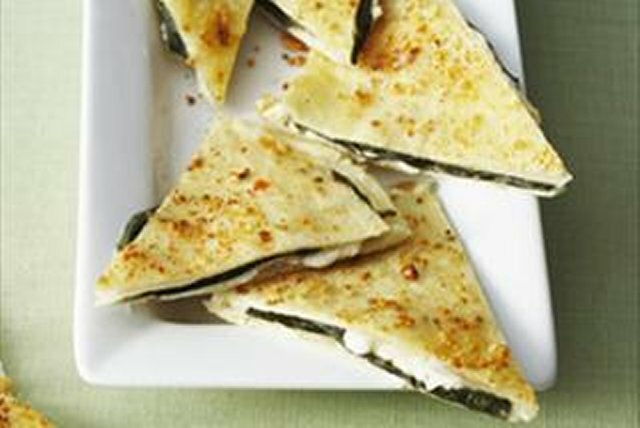 Simple cheese quesadillas get a dressed up look and taste. Preheat oven to 400ºF. Place 1 tortilla on baking sheet; spread with cream cheese. Top with mozzarella cheese, basil and second tortilla. Brush with dressing; sprinkle with Parmesan cheese. Bake 8 min. or until golden brown. Cut into eight wedges to serve. Substitute Cracker Barrel Shredded Mozza-Cheddar Cheese for the mozzarella cheese. Serving Size Makes 4 servings, two wedges (21 g) each.